Going to a beach with a beach-chair is not always an option. While relaxing on your towel spread on the hard-wet ground gives no fun at all. Instead of spreading your towel on the hard floor, while not consider using an inflatable lounger? Most inflatable air loungers weigh less than 3 lbs! They are easy to carry about and can be inflated without an air pump. 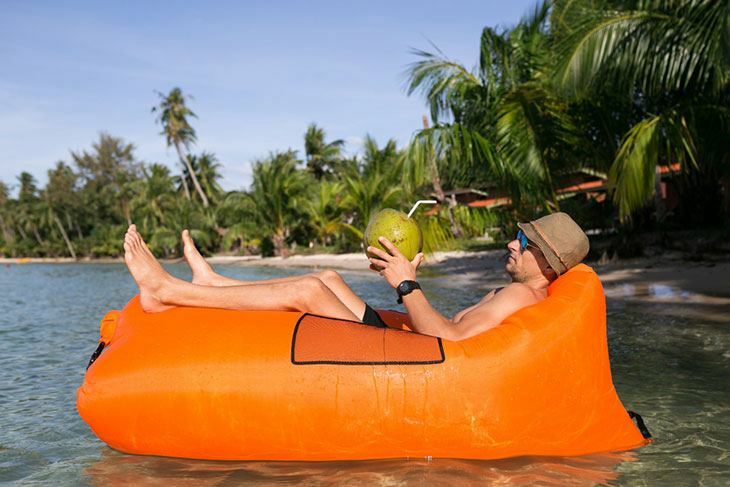 If you want to enjoy nature, or looking to relax in the sun in comfort and in style, you should consider the best inflatable loungers available. We are here to help, providing you a buying guide and few tips to make your air lounger last. If your search for the best inflatable air lounger has brought you to this product, you should be super excited! The AlphaBeing Inflatable Lounger Couch is light, easy to move around, durable and built to last. It makes it the ideal air lounger of choice. Inflating this beauty is a fun time for the whole family. It comes in arrays of colors, which makes selecting a color that matches your lifestyle super cool. I love the addition of bottle opener and side pockets on this lounger. You will realize how comfortable this lounger is when you start using it, you will be happy you settled for this lounger. It affords you up to 8 hours inflation time and supports up to 500 pounds in weight. There are not many better loungers out there that can accommodate families and friends and for that long. Throw in the fact that it is light, easy to move around, durable and built to last. It makes it the ideal air lounger of choice. It is made from excellent breathable polyester material, you cannot get overheated as on a regular sofa. Windy days are no worries, in fact, inflating on such days is easy. This air lounger comes with stakes to hold your lounger in place. The AlphaBeing Inflatable Lounger Couch easily rolls and fit back into the carrying bag after use. It weighs 2.6 pounds after full inflation. You can allow any of your kids to be your helper, and carry your air lounger to the beach. If you are looking for a lounger slightly different from the regular outdoor inflatable loungers, the WEKABO inflatable lounger gives that extra little something. This lounger was designed with the ultimate comfort of users in mind. It comes with a unique pillow design for maximum comfort. Allowing you to rest your head while providing support for your back. Another feature I really like about this lounger is the ease of inflation and deflation. Inflation takes seconds, you just whisk the lounger through the air, and seal the panels. No need for additional equipment or air pump to get it inflated. Deflation is even much easier, just open the sealed panels! The Wekapo lounger is rugged, it was designed with an anti-deflation technology which gives it the ability to retain its shape for 5 – 6 hours. This gives you maximum enjoyment without needing to inflate it all the time. Do not worry about windy days. You can stake down the wekapo air lounger and be protected. You can easily transport and store the air lounger in a carrying bag included as part of its buying package. It may become hard on the back if you use it for a very long stretch; otherwise, all your lounging needs are adequately catered for by this lounger. Wekapo has a 100% risk-free satisfaction guarantee, its lounger is built to last, you will enjoy it for years. Searching for an elegant lounger that goes beyond the sand? The Floating Chaise Lounger by Kelsyus is the perfect lounger for any calm body of water. This top-rated lounger provides maximum relaxation when floating on pools or on gentle waves. It comes in a design that allows you to sit upright and still be comfortable. The lounger is fitted with chairs covered in mesh fabric to help you keep cool. While including a cup space holder to help you relax with your favorite beverage. Sitting on this inflatable lounger means your body lies just a little bit below the surface of the water, giving you the maximum cooling comfort. The inflatable lounger comes with an extra level of safety. You can fasten to a stake to ensure you do not drift off while on the water. It is easy to inflate and deflate, as it comes with jet valves. Do you own an air pump? You do not need one! The Floating Chaise Lounger by Kelsyus folds into three small circles when you are ready to take off. If you need some relaxation in the sun, this inflatable air lounger helps you enjoy some fun. It is easy to set up and disband. While relaxing, you can calm your nerves further with your favorite drink at hand. 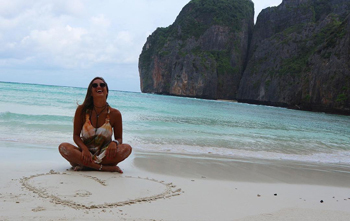 Compact, beautiful, and rugged, do not plan your beach days without it. The cup holder is not large enough to hold bigger water bottles, the size it contains is right for me, especially the fact that I do not have to worry about condensation seeping and ruining my vibe. 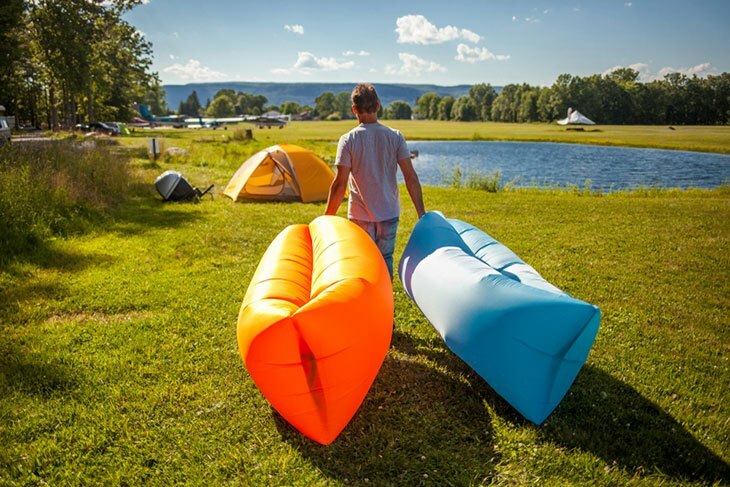 If you are a fan of straightforward and traditional designs with two side pockets for a tablet, magazines or phones, the Legit Camping Inflatable Lounger ticks the right boxes. This air lounger features simple, comfortable, elegant design and for an inflatable air lounger, it is a great choice. It is made from quality nylon materials so you can take it anywhere. Slops, snow, sand or surf, this air lounger inflates very fast and is good to go in under a minute. And for just 2.5 pounds, your kids can carry it to the beach. The characteristic plastic smell found on most air lounger is absent on the Camping Inflatable Lounger. It comes in different colors, you can choose the one that matches your lifestyle. The legit Camping Inflatable Lounger is durable and comes with a waterproof 190T ripstop polyester. It can float around comfortably and safely on your swimming pool. You do not need to run around to inflate your air lounger. It comes with a double air inlet which boosts your air hammock in seconds. Does Polyester Keep You Warm – Is It Enough to Fight the Cold? It comes with an anti-deflation technology which allows It stays in shape for long hours after inflation. You will get maximum relaxation without having to inflate all the time. It is sturdy, comfortable, lightweight, and rugged enough to support 400 pounds. The storage bag provided to store this lounger is a little bit small, you might need a few practices to get it into storage fast. You might need to fill one chamber at a time. The Anglink Inflatable Lounger Couch is one of the top air loungers on the market. It is rated highly for its comfort, longevity, design, and ease of inflation. Sitting on a lounger for long hours can be uncomfortable and painful for your neck. This informed its quality design which includes a comfortable headrest. This air lounger is large, it offers excellent comfort for your neck and upper back firmly. It comes with an innovative 2-port design, double layered 210T PU fabric material for maximum comfort to the user with no air leakages at all. The Anglink Inflatable Lounger Couch holds its shape for 5 to 6 hours after inflation. It needs no external pump at all, unpack, whisks in the air, and you are good to go. Also, it is lightweight, coming at about 2.6 pounds which can be disbanded and folded easily anywhere, anytime. It is portable and compact, easy to clean and gives you soft feelings. You can use it on the swimming pool, rocky terrain, as well as on grass. You can enjoy this lounge at home as a chair, a sofa or as a bed. It is soft, comfortable, breathable and provides great fun for kids. You might need a little help inflating it the first time after purchase, after which you will discover it takes less than a minute to have it ready subsequently. No instruction for setup provided. An inflatable lounger provides comfort and relaxation, but not all loungers have easy inflation process. The inflating process is crucial when making a buying decision, ensure your lounger of choice does not need an air pump to inflate. A simple inflation process should involve holding out your lounger, and it is air auto-filled. Check the video below for how to inflate your air lounger. If you are fortunate to have a windy day, you can swing your lounger to get filled with air. Tick this buying checklist before buying your lounger, you will save money and energy and time. When trying to make an air lounger purchasing decision, you need to consider how long it will stay in shape after being air filed. Your choice of lounger should be the one that holds air for an extended period. Certain air loungers can hold air for approximately 7 hours. However, an air lounger that stays in shape for 4 hours or more is good. If you plan on moving around with your lounger, it must be light and portable when deflated. There are air loungers that weigh 2 pounds or less, this should influence your buying decision. The quality of an air lounger is important. A quality air lounger should be thick enough to withstand air pressure when laying on it. The best air loungers are made from the best quality material available such as nylon. Furthermore, if you plan on floating on water for several hours, you need more than just durable or rugged, you need a waterproof and stainproof air lounger which requires less maintenance and last on water for long. You should choose an air lounger that comes with a warranty. This gives you confidence the manufacturer will repair it if something goes wrong with the product. Choose a lounger with at least a year warranty. Most of the air loungers available today come with side pockets. These provide lots of flexibility, allowing you to keep your stuff safe while relaxing. These extra something like a cup space holder adds value to the air lounger. The air lounger of choice should be capable of use for different activities and events. It is essential to determine the type of environment you will be using the lounger, indoor or outdoor. Additionally, check if the air lounger is water-resistant. Some air loungers are designed to be used as a float in the pool while some are for sitting on the sidelines. Carry out a usage audit will help determine the perfect air lounger for you. When making an air lounger purchasing decision, you should pay close attention to its comfortability. Check the physical build to see if its soft. An air lounger is meant to be used for long hours, hence, need to be super comfortable. This will help keep your neck, head and back relaxed without strains. Check to see if your lounger of choice has a built-in headrest for support. The design should be premium while looking durable, light, and rugged. The headrest gives the air lounger a unique look while providing comfort. Air loungers come in various designs and sizes. Consider where you will be using your air lounger when making a buying decision. Do not exceed the weight limit: bouncing on the air lounger with family and friends is great, but try not to surpass the weight limit or else you ruin your lounger. Use a stake while setting up the lounger: when setting up the lounger, make use of a stake to avoid chasing your lounger all around. Additionally, if you plan to sleep on the lounger, stake it to avoid tripping over while asleep. Roll up when done: air loungers come with storage bags. To keep your lounger in top condition, roll it up to release extra air and carefully stored in its container. Do not use your air lounger around sharp objects: avoid using your lounger where there are sharp objects like stone, rocks, etc. These objects can rip through your lounger. The above-listed air loungers are the 5-best air inflatable loungers available for individuals and families. They have a rugged design, retain shape for long and are super easy to inflate. Any of the above choices will serve you well. 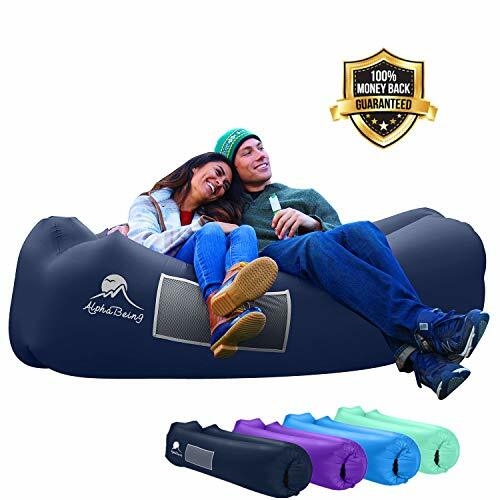 Looking at the features, which transcends duration, quality, warranty, portability and so on, I would recommend AlphaBeing Inflatable Lounger Couch. EASY INFLATION DESIGN -- No pump required for AlphaBeing air lounger. Just a few scoops of air and this inflatable lounger is ready to hangout in. This is a must-have for any BBQ, Pool Party, Beach, Hike, Concert, or Camping Trip. Folding to 12"x 8"x 4"and fitting in its own carrying bag with shoulder strap, this air sofa is ready to be taken anywhere with you. ANTI-DEFLATION TECHNOLOGY -- Love the idea of an inflatable couch but hate the idea of constantly needing to fill it up? Thanks to our anti-deflation technology, our air chair retains air twice as long as other Inflatable Loungers for an experience that is amazing! Our lounger is made with superb craftsmanship and high-quality Ripstop fabric that is lightweight, comfortable and strong enough to support 400lbs! UNIQUE HEADREST DESIGN -- Our Unique Ergonomic Neck Pillow headrest allows you to relax with maximum comfort. Just throw it in the back of your car then blow it up at the beach, parks, camping, hiking, traveling, music festivals and any other outdoor adventures. Feeling lazy? Just chill in your backyard with our air hammock. POCKETS, BEER OPENER & SECURE STAKES: Our inflatable couch has 2 large mesh pockets on one side to store magazines, glasses or iPad and the other side has an elastic strap for your ice cold beer; All important things are within arm's reach. AlphaBeing Camp Chair even includes a beer opener to help you chill when you hangout with your friends and a securing stake to hold the inflatable couch firmly in place on a windy day. 100% RISK-FREE WARRANTY -- At AlphaBeing, our mission is to be Amazon's most customer-centric brand. So we stand firmly behind our product quality and service. If you are not 100% happy with the blowup couch for any reason, simply write us and we will Refund or Replace your Purchase. NO QUESTIONS ASKED. It is ideal for hiking, camping, pool, beach parties and many more. It is designed to handle the worlds hardest terrain, it is lightweight and easy to clean. It offers excellent value for money. There you have it! My top-rated air lounger. If you have a different opinion, if another listed air lounger deserves the top spot, let me have your views in the comment box.